Matthew John Wise was born on November 18th 1975 in Montclair, California. The six foot four right hander attended Pepperdine University in Malibu California as well as California State University. The right handed pitcher was drafted in the sixth round by the Anaheim Angels in 1997. After winning nine games in three of four minor league seasons he was brought up to the Angels team in 2000 for eight games. He made six starts & went 3-3. In the Angels 2002 Championship season he pitched in seven games but was back in the minors by mid July. He hurt his arm needing surgery & missed the entire 2003 season. He was released & got signed by the Milwaukee Brewers where he would pitch in relief for four seasons. In the winter of 2007 he signed with the New York Mets for the 2008 season. 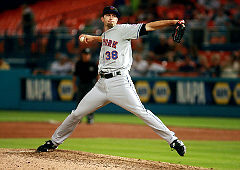 Wise debuted with the Mets on Opening Day pitching the 8th inning in relief of Johan Santana in his Mets debut. 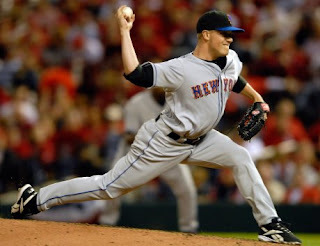 Wise allowed two hits, retired one batter & was replaced by Scott Schoeneweis in the 7-2 Mets win. The next day he entered the game in the 10th inning with the score tied at 4-4. He served up a walk off game winning HR to Robert Andino, as well as it being his first career HR. On May 13th he earned a hold against the Nationals and made five more appearances that month. He was sent down to A ball St. Lucie where he pitched just three games before ending his career. He pitched in eight games for the Mets 0-1 with a 6.43 ERA. He was granted free agency & ended his career after that season. In his eight year career he was 17-22 with two saves, 244 strike outs 106 walks in 317 innings over 209 games.